Powers/Abilities: Clare Dodgson had no superhuman powers, although she was quite skilled in detective work and shared a close bond with her twin sister that allowed to her sense her feelings at time. This did not appear to be any sort of superhuman power, given that twins often sense each other's feelings. She often carried a handgun. 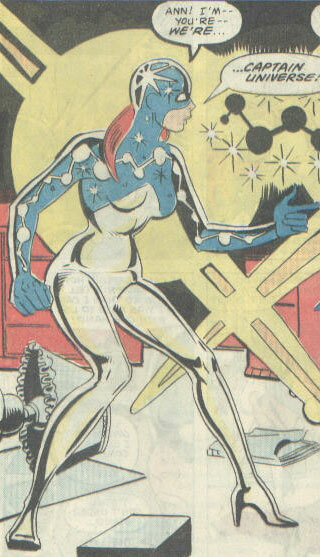 As Captain Universe, Clare could manipulate cosmic energy for varying effects including Univision which forced those affected by it to tell the truth, flight, superhuman strength, and heightening the natural empathic bond with her sister to superhuman levels. History: (Marvel Spotlight II#10) - Clare Dodgson used knowledge gained in her detective work to help convict a group of criminals working for the crime lord called the Nemesis. After the court appearance, her brother-in-law Edward Stanford invited her over for dinner at her sister Ann's house that night, which Clare happily agreed to do. Later that evening, when Clare arrived for dinner she sensed that something wrong and deduced that Nemesis' men had taken her sister Ann and her children hostage inside the home. Clare knocked on the door to throw the crooks off and then leapt through the window, taking them by surprise. As Ann sent the children to safety next door, Clare held off the men until both twins were contacted and chosen by the Enigma Force, which transformed them into twin Captain Universes. Realizing that they had to use their newfound superpowers to save Edward, Clare used her Univison on one of the men, forcing him to tell the truth of what he knew about Stanford's disappearance. The crook told her to ask Rooney and the sisters set out to the crooked gym of wrestling manager Mike Rooney. At Rooney's, Clare asked Mike himself about his connections to Nemesis and Mr. Rooney sent goons after the women. After easily defeating the goons using her superhuman strength, Clare used her Univision on Rooney himself and discovered the location of Nemesis's headquarters. 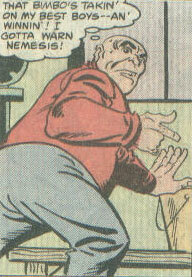 The twin Captain Universes then made their way to Nemesis's Drive-In hideout, where they were attacked by more goons. During the battle, Ann was trapped in a room that filled with water, but Ann managed to empathically contact Clare, who quickly came to her rescue. Trailing Nemesis as he made his escape, the twins were nearly ran over by Nemesis's car until Nemesis swerved at the last minute, crashing. 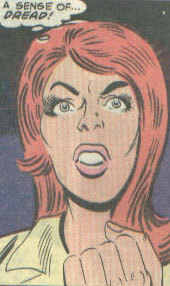 Clare immediately grabbed Nemesis and removed his mask, revealing Nemesis to be Edward Stanford himself, who was trying to kill Clare to prevent his identity from being found out. After Edward was arrested, Clare returned with Ann to the Stanford residence, where the Uni-Power left them both. Clare then watched as Ann explained to her children what had happened, wondering if Ann didn't actually need the Uni-Power because she already had her own strength. Mike Rooney was a crooked wrestling manager who worked for Nemesis. When one of Nemesis's men pointed the twin Captain Universes toward Rooney's gym, Rooney was soon contacted by the women. Clare asked him about information on Nemesis, but Mike refused to give her any. Instead, Mr. Rooney sent his own wrestling goons after the girls until Clare's sister, Ann, hung Rooney from the gymnastics rings. After the battle, Clare used her Univision on Rooney, forcing out the knowledge of Nemesis's headquarters.